First Leon County Courthouse, 1846, Leona – Leon County was created in 1846. Upon the organization of the county, the town of Leona, located near the southern county line, became the county seat. However, in 1850 the seat of government was moved to Centerville near the geographical center of the county where it has remained. Leon County Courthouse 1851, Centerville – Built for a cost of $2,200.00, it was a two story frame structure with projections on each side. 40′ x 40′,. Leon County Courthouse 1858, Centerville – In 1858 the original courthouse was replaced by a brick building at a cost of $8,000.00. This Antebellum courthouse, which must have been a Greek Revival styled work, served well through the Civil War and Reconstruction. Nonetheless by the 1870’s numerous repairs had become imperative and in 1873 a tax was levied for building a new jail and repairing the courthouse. The courthouse roof was recovered and the old shingles were sold. In addition the chimneys and windows were repaired. The courthouse burned November 9, 1885. Two vaults in the courthouse survived the fire with some damage and were left in place. In response to an urgent need for a safe depository for records, an order was issued by the commissioners’ court to build two fireproof vaults on the site of the old courthouse using bricks from the ruins. A new temple of justice was to be built around these. These vaults were to be located in the space that had existed between the offices of the county and district clerks. Then a resolution was introduced to build a new courthouse on the same plan as the old. Leon County Courthouse 1886, Centerville – William Johnson designed the Leon County Courthouse in 1886. The building is small in size and displays attractive, although restrained, design features. The plan is rectangular with a single corridor extending lengthwise through the ground story. There are three offices on either side. A single stair in the corridor provides access to a landing on the north side of the second story. On either side of this landing is a small jury room, while the courtroom occupies most of the second story space. The foundation is of brick laid upon firm clay bearing three feet below the surface. The walls are constructed of brick with English Portland cement in the mortar rather than lime. The floors are structured with wooden joists, and there are cast iron ventilators in the walls to protect the ground floor joists against rot. Window and door openings are spanned with stilted brick arches. A transom was installed above the second-story windows to accommodate the high ceiling space of the courtroom. On both stories, window sashes with two-over-two lights are hung with cords and weights. The window sills are iron. The north and south facades are divided into five bays by brick pilasters with corbelling intended to represent Classical Doric capitals supporting an architrave. The east and west facades are similar but with only four bays. The east facade differs from the other facades in that the two central openings of the ground story are filled with brick panels. A small portico supported by paired iron columns with pedestals and modified Corinthian capitals emphasizes the south entrance. These bear upon low brick walls and support a wooden balcony with a decorative iron railing. Additional embellishments include brick stringcourses, a sheet metal cornice and chimneys with ornamental caps. The interior still retains most of its nineteenth-century character. The ceilings on the first and second floor are beaded lumber, rather than plaster and pressed metal. Leon County Courthouse, October 2005 from the Portal to Texas History. Photograph of the Leon County Courthouse. Two men sit on a bench in front of the courthouse, and a trash can has been left on the sidewalk leading up to the front entrance. Leon County Courthouse. Built 1887 of slate brick, locally made. One of oldest Texas courthouses still in its original state. County created in 1846. 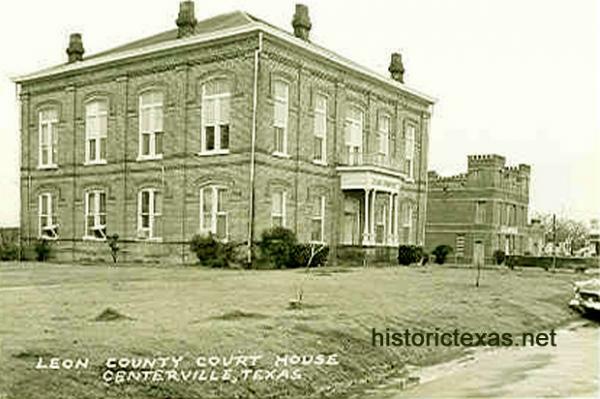 County seat was moved from Leona to Centerville in 1850. Two earlier courthouses have occupied this site. Recorded Texas Historic Landmark, 1966.